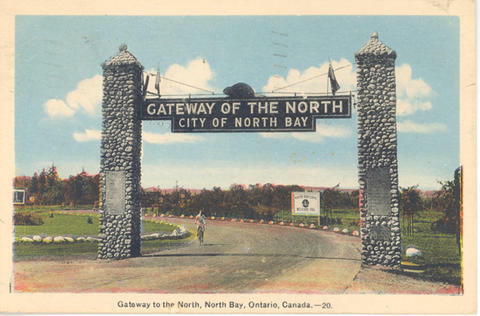 Item 071 - Gateway to the North, North Bay, Ontario, Canada.--20. Post card was cancelled at North Bay, Ontario on 19 July 1945. Card is addressed to: Oscar Kroemer. 821 Pasadena Dr. Ft. Wayne. Ind. Message reads: Fishing - Climate & everything really fine. No large ones caught, but 15-20 pike in 3 hrs is not unusual. Best Wishes. Ralph.